Food Fiesta is a competition where participants are individually judged against a standard. This means that everyone has the potential to receive a blue ribbon if they do an outstanding job and receive high points from the judges. Feedback is given to encourage growth and thus members who have participated in prior Food Fiestas will likely see improvement in their scores each time they participate. There is no best of show in Food Fiesta. Food Fiesta is a positive event where camaraderie and mutual support between participants is encouraged. The development of essential life skills is an important characteristic of 4-H programming. 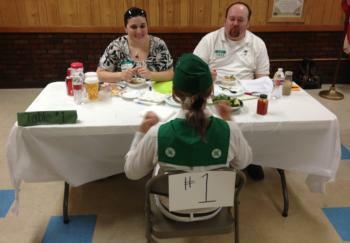 In Food Fiesta, participants develop their interviewing skills. Although job interviewing may be far in their future, 4-H members may have interviews as youth when applying to be babysitters, assistants in religious schools, camp counselors in training, community volunteers, for leadership roles, etc. Past participants in Food Fiesta have expressed that they have improved in their presentation skills and have become more confident in small group speaking. So come to Food Fiesta to present your food, and know that it isn’t just cooking skills that are being cultivated! Members enrolled in projects related to food/cooking projects. Members not currently enrolled in a food project must verify they've viewed the required Safe Serve food handling videos. The goal this year is not only to welcome back all the favorite recipes but to also embrace the new. Pinterest, Instagram and many shows on tv have invited us into a new world of copycat recipes, fantastic foods and many different ways to decorate a cupcake. What inspires you?